Entire books have been written on Parisian popular culture and history, so our brief introduction will be just that! Paris is the French capital, and home to well over 2 million people. It started growing in influence in the 15th century, but reached its current status in the late 19th following the fall of Napoleon and several revolutions. 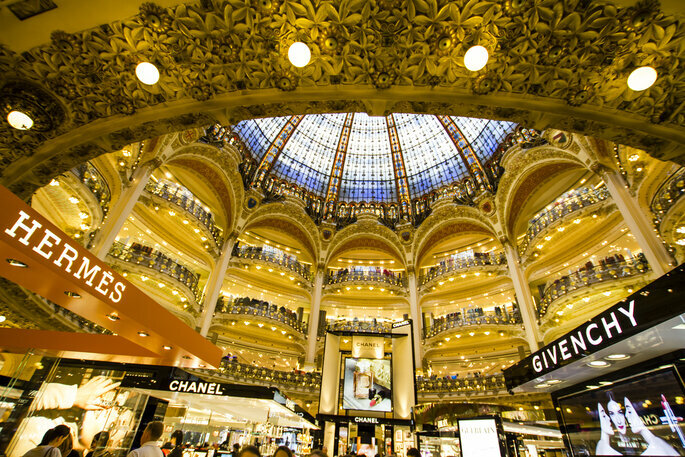 It is a cultural hub, boasting some of the most famous landmarks and artworks in the world – the Eiffel Tower, the Champs-Élysées and the Palace of Versailles amongst them – whilst also credited for launching some of the most famous fashion houses, such as Chanel, Dior, Louis Vitton and Givenchy. And if this wasn’t quite enough, Paris is also a treat for all of you foodies out there. Home to the most Michelin-starred restaurants in the world, and with a range of culinary options from escargot to éclairs (oh, and all the wine and champagne too! ), you could easily spend your entire honeymoon sampling the food in this amazing city. With regard to language, you will be absolutely fine communicating in English as most people there speak it – however, this is the one city where you should definitely make an effort to pick up a few phrases! So read on now to discover more about this city: what you can get up to on your romantic honeymoon, surrounding areas you should try and visit, the dishes you must try, and recommendations on where to stay. Your trip will be a roaring success! When it comes to Paris, it could potentially be easier to list the few things that aren’t worth the time – because there is a whole lot that we recommend to do! So we’re going to go with the absolute essentials here. 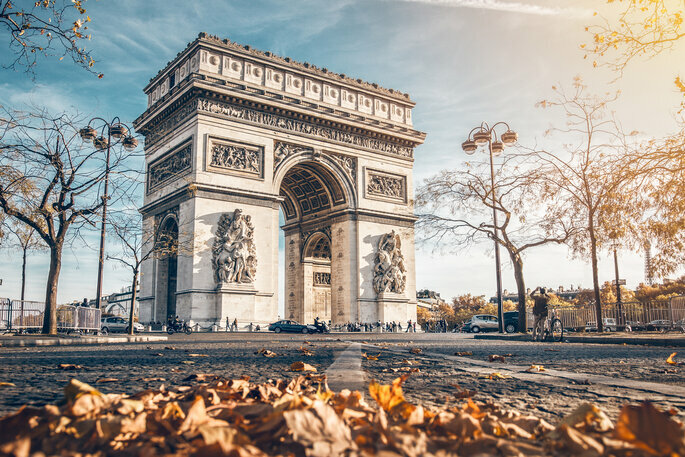 First off, Parisian architecture is amongst the most sophisticated in the world, and so you have to check out the major landmarks – this includes the Champs-Élysées, the ornate Pont Alexandre III, the Notre Dame Cathedral, and the Pantheon. Each of these places have their own special qualities, which just have to be seen up close! 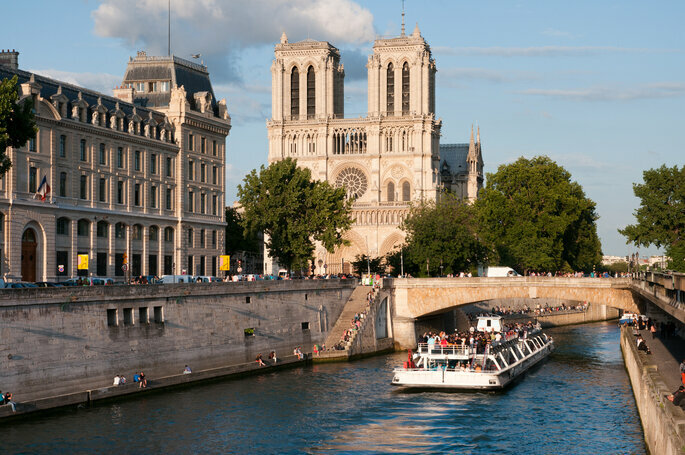 One of the most best things you can do whilst on your honeymoon in the City of Lights is take a boat tour down Paris’ main river, the Seine, which boasts a view of the Eiffel Tower and Notre Dame. Enjoy a candlelit meal in an intimate corner of a luxury riverboat, in one of the most beautiful places in the world. 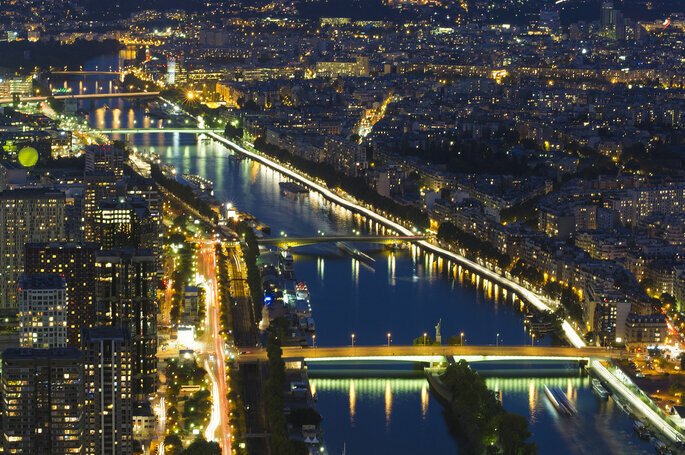 You’ll be able to experience the magic of Paris at night, with millions of lights guiding your path down the Seine. We can’t think of anything more romantic! Even if you are not a huge art fan, spending a few hours in the world-famous Louvre is a fantastic use of time. Famously home to the Mona Lisa, but also other historic works such as the Aphrodite statue, Delacroix’s “28 July: Liberty Leading the People” and Canova’s “Psyche Revived by Cupid’s Kiss” (which is the epitome of romance! 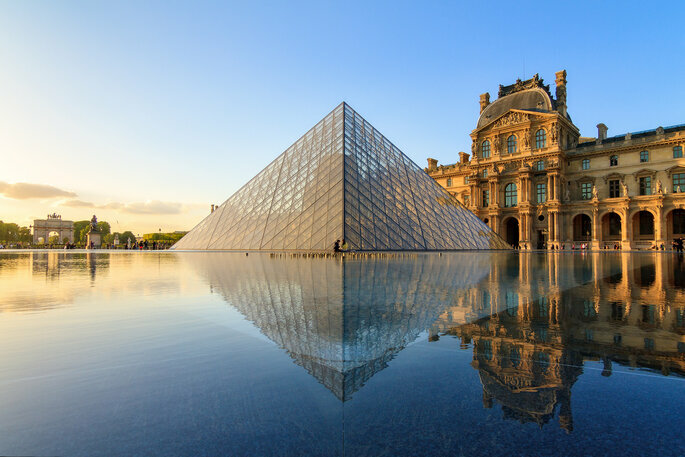 ), the Louvre is a Parisian staple. And if you are a fan of art, then you should try and get to the Musée de l’Orangerie. 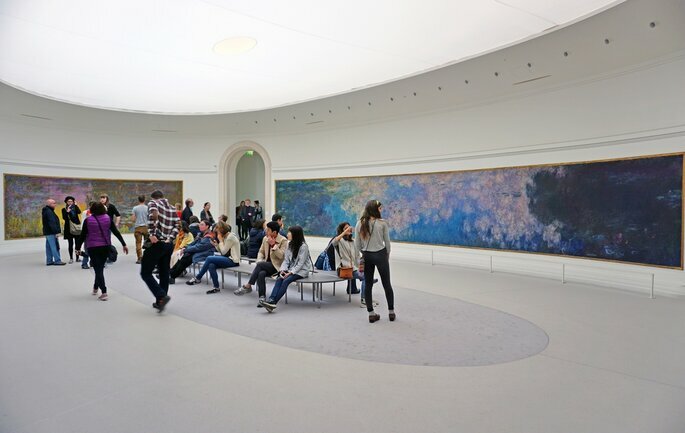 Full of impressionist and post-impressionist images, it is most famous for housing Monet’s “The Water Lillies – The Clouds” which take up two rooms alone. For a submersive art experience, located in the gorgeous Tuileries Garden, there is nowhere better in Paris. And of course, it goes without saying that a trip to Paris that excludes the Eiffel Tower is not truly a trip to Paris at all. If you have been together as a couple before then you can afford to miss it for the second time, but if this is your first time, then it is a MUST. Book tickets in advance to avoid the horrific queues, and ascend 906ft for a view of Paris that will just take your breath away – a view so romantic that one questions if that was the purpose of the building in the first place! 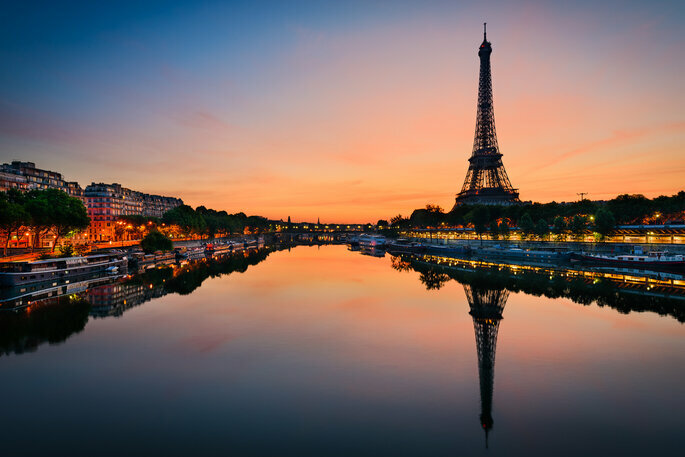 And finally, although it is not a must-do for your trip to Paris, there is one additional attraction that we think would be just perfect for newlyweds. 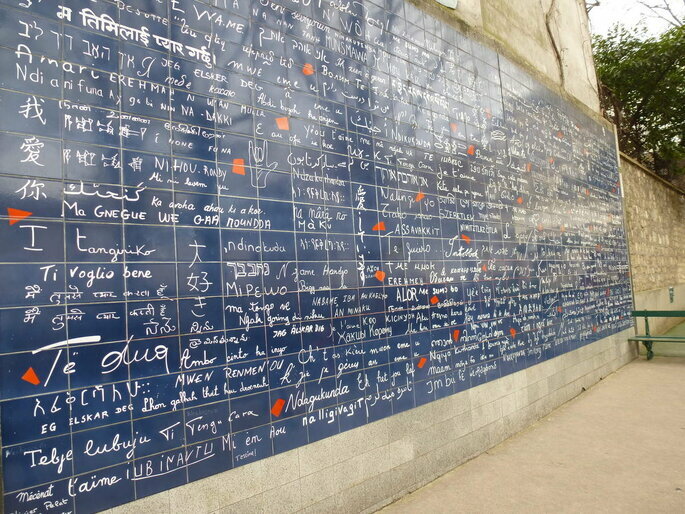 Le mur des je t’aime is a small public artwork in Montmartre, made up of hundreds of dark-blue tiles upon which are written the words “I love you” in nearly 250 different languages. The perfect place to go! Just 13km outside of the centre of Paris, you will find the grand Versailles Palace and Estate. 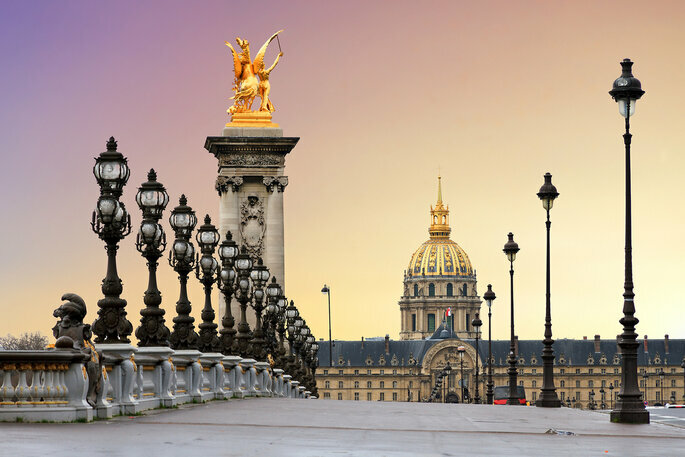 The home of the French monarchy – before France became a Republic – and the place where the historic WWI-ending Treaty of Versailles was signed in 1919, this is an absolutely unmissable destination for your honeymoon. 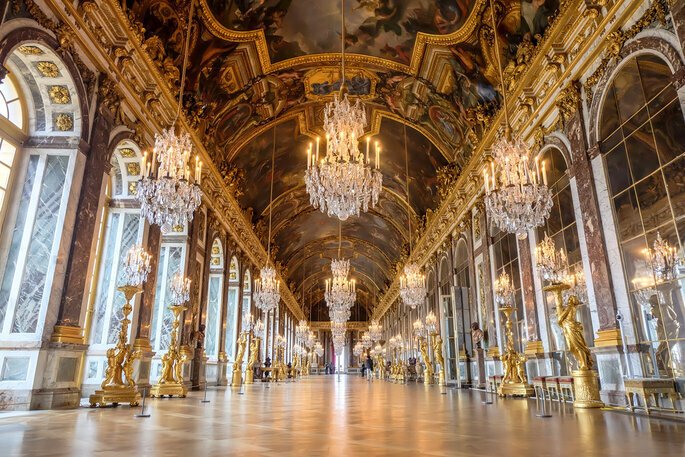 Visit the incredible Hall of Mirrors, and revel in the stunning architecture and historic grounds. 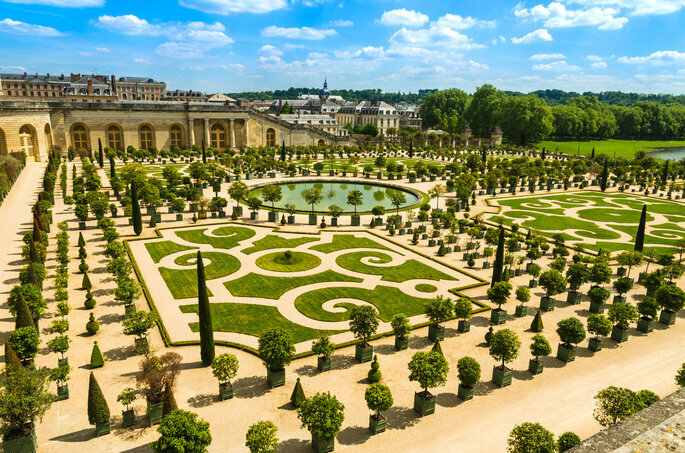 And surely one of the most impressive parts of the Versailles Estate is the 250-acre gardens, perfectly maintained all year round, and a bastion of luxury. Take a romantic stroll as the sun sets, and explore this wonderful corner of the world. Unlike many of our other honeymoon recommendations, we do not think it is necessary to voyage outside of Paris (unless you are staying for over 2 weeks, in which case, Dijon, Bordeaux and Lille are waiting for you!) 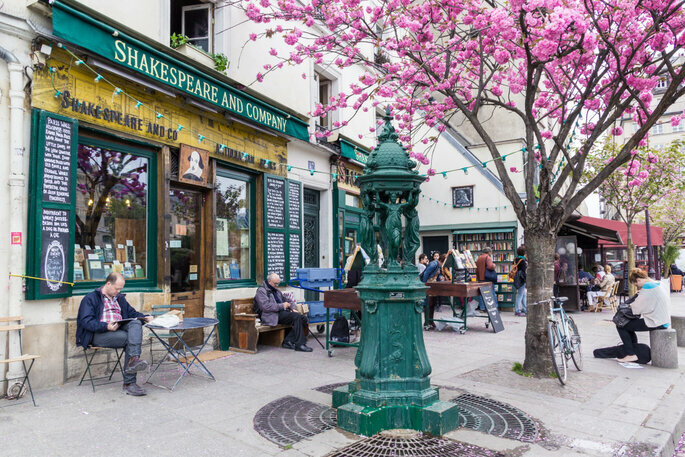 It is highly unlikely that even in a week you will be able to explore and experience everything Paris has to offer: for example, you should definitely go to Saint-Germain-des-Prés, a neighborhood in the 6th Arrondissement. 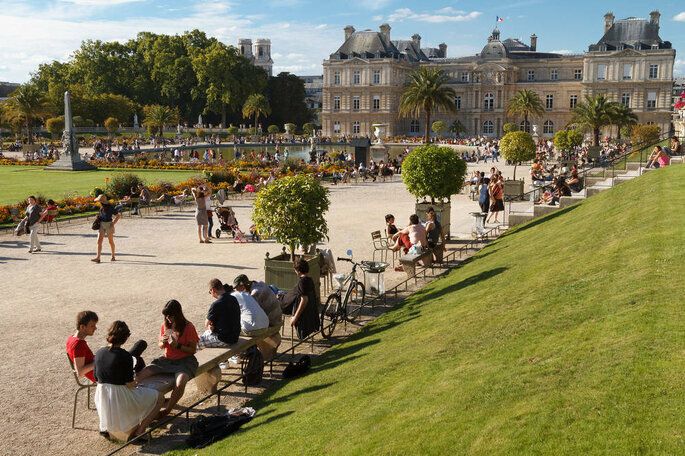 It is amongst the wealthiest in Paris, and is a cultural hub full of the most innovative and modern exhibitions and cafés. And of course, regardless of the fact that you are on your honeymoon, you cannot go to Paris and not shop. 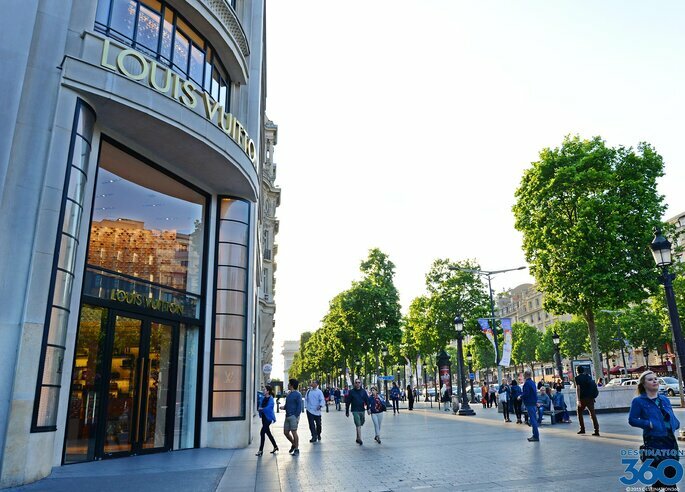 Whilst doing your sightseeing tour, you have to stop at Avenue des Champs-Elysées to explore the shops on offer; from Cartier to Louis Vuitton, here is where you feel the real wealth of Paris. For more alternative, vintage fashion, then head back to Saint-Germain, or try out Le Marais. Paris is a part of the European-trio of incredible food, alongside Spain and Italy. 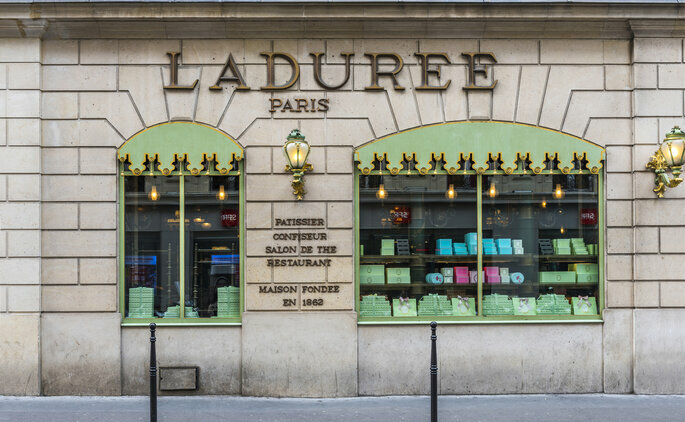 The home of some of the most exquisite pastries in the world, definitely head to Paris’ most famous pastry shop L’Aduree to try out their signature macarons, their meringue tarts, or their expertly layered millefeuille. A far cry from the – admittedly delicious – pastries you can get at Tim Hortons, L’Aduree is a staple of this wonderful French city. And moving on to the main course, then there are a thousand options for you to try. 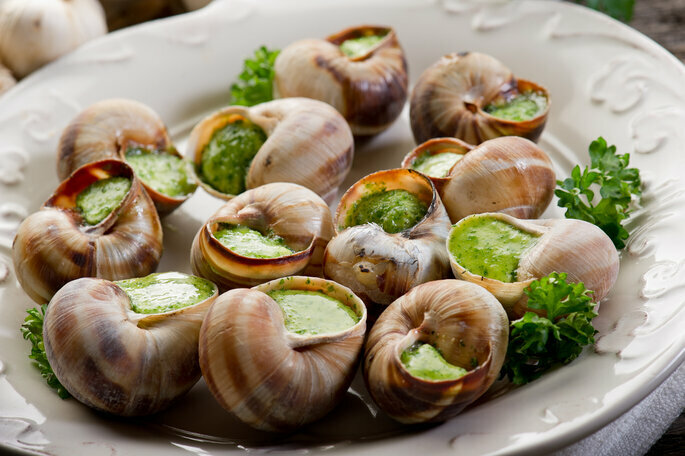 It might be cliché of us to recommend that you try escargot whilst in France – but they are a fantastic culinary option, particularly when prepared and served with a fine garlic sauce. Beyond that, the whole world is at your fingertips – beef bourguignon, ratatouille, coq au vin, ragout, potatoes lyonnaise… There is something for everyone in the City of Lights! And would this be a real article about France if we didn’t talk about the cheese on offer? 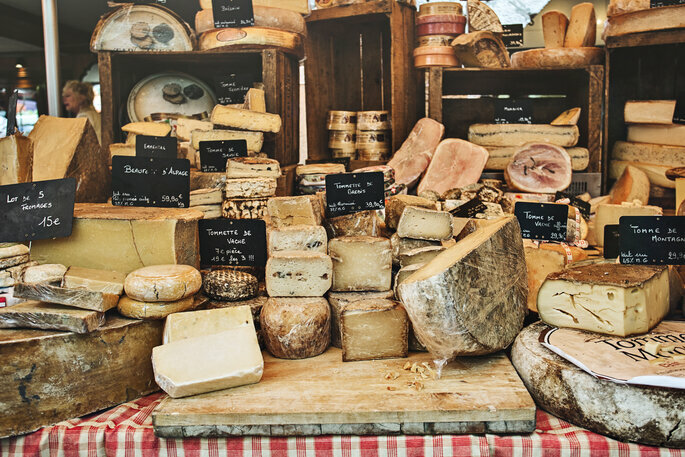 If you want a true taste of some of the finest cheeses in the world, then head over to the Fromagerie Laurent Dubois, where their expert cheesemongers will point you towards something best suited to your palette. Pair this with a fabulous Château-Grillet and some crackers, and you’ll be well on your way to a wonderful afternoon or early evening treat. Wow the senses (and your stomach!) on your honeymoon in Paris! 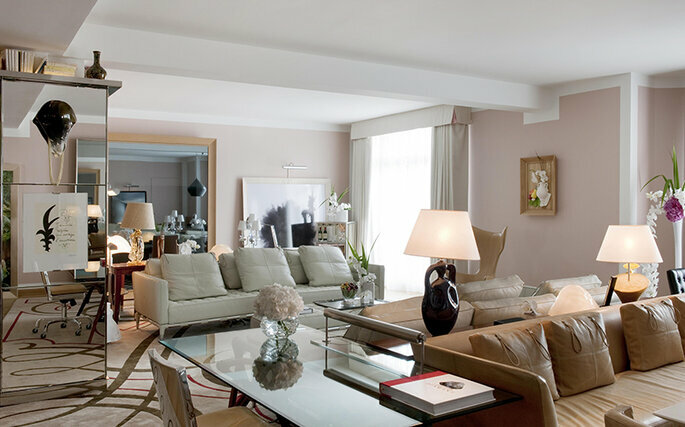 The Hôtel Le Royal Monceau Raffles Paris lives up to its regal title, offering luxury suites (admittedly at luxury prices too!) for honeymooners. With rooms so beautiful that you won’t want to leave them, you’ll have a fantastic view of Avenue Hoche where it is located; one of the fanciest neighborhoods in Paris, you’ll be in excellent company – and in absolute comfort too! However, if you are after something a little different, then why not try somewhere like the Maison Souquet? Refusing to compromise on style and individuality, the extravagant decoration of this hotel will leave you breathless – and is the perfect complement to a city whose foundations are found in the art world. Looking like a grunge version of the Art-Deco era, this is the perfect backdrop for a sensual honeymoon. If you’re still not convinced that Paris is the perfect place for your romantic honeymoon, then we admit defeat! We promise that your trip to this famous city with not only be incredibly exciting and glamorous, but full of new experiences and unforgettable memories. You will truly have the time of your life, and bring back a whole host of photographs to make all your family and friends jealous! 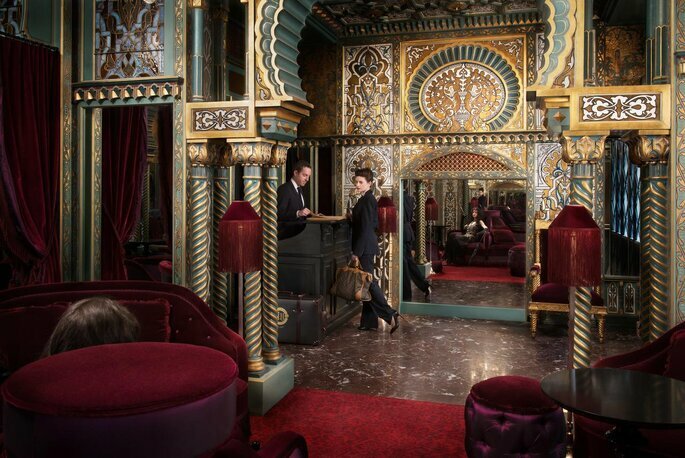 So book those tickets now, and say bonjour to a whole new world of sophistication and luxury.